Remake the Remake: Mommy! The TV People Are Here ... Again. Many films have been given the ol’ remake treatment, few have come out unscathed. Some examples of such are, The Wicker Man, The Omen, Friday The 13th among many, many others. So when I discovered that the latest film to be remade was the 1982 masterpiece, Poltergeist, I was not amused. I get it. Kinda. Remakes can sometimes serve to add something extra to the original films, i.e in the remake of The Fog, without spoilers, the ending made more sense than the original but was still a terrible film.They can also portray a character in a new light, for example Jason in the remake of Friday The 13th was made to be a more “realistic” killer, apparently. Of course the obvious thing is with remakes is that they can attract new, and old fans to a particular series or standalone film. Bums on seats, wonga, dosh, you get it. 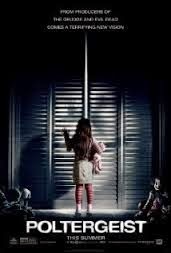 My problem with remakes is that they are completely unnecessary, and the remake of Poltergeist is no different. Poltergeist (1982) Directed by Tobe Hooper (The Texas Chainsaw Massacre 1974) Produced by Steven Spielberg, and Frank Marshall. Story by Steven Spielberg who also wrote the screenplay along with Michael Grais and Mark Victor. 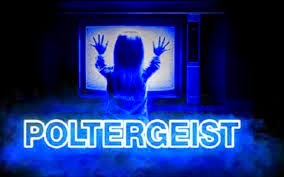 Poltergeist tells the story of the Freeling family, who live in a community called Cuesta Verde in California.The story begins when the Freeling’s youngest daughter awakens one night and begins talking to the television that is showing static.Something comes out of the TV and triggers a violent earthquake, then more bizarre events follow. All seemingly harmless at first, but then the phenomena starts to intensify. 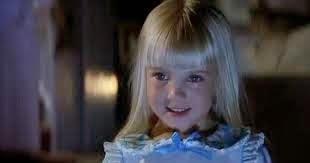 Carol Anne (the Freeling’s youngest daughter is sucked through a portal in her wardrobe. Then her disembodied voice can be heard through the TV. A group of parapsychologists come to investigate and they eventually bring help in the form of the medium, Tangina Barrons, who can only be described as awesome! If you haven’t seen it then I’m not going to spoil it. But it is a wonderful movie with some fantastic moments and it is what I would describe as an enjoyable horror film. Is it scary? Not really, in the conventional sense, It is pretty tame, but that’s a good thing, It really doesn't pretend to be anything else. The remake of Poltergeist is set to be released on May 22nd in the US and UK and is directed by Gil Kenan and produced by Sam Raimi, whose work I’m a fan of. We already know the trailer shows that it is a reboot and although has a similar set up to the original film, it follows a different cast of characters. We can also tell from the trailer that it is probably going to be a little scarier than the original, and another thing is despite a good cast in the remake/reboot, to me, it has none of the magic that made the original so damn good. It feels empty, devoid of any wanting to discover what the hell is going on in this particular house. It seems to be yet another horror-by-numbers film. Of course I could be wrong, but already It looks to me like it’s just trying to reinvent the wheel. Like taking a piece of art and adding a moustache and glasses to the portrait. So what is my problem with this particular remake? Well, I feel it is probably a bridge too far for the remake list. This remake/reboot just seems like it’s the proverbial straw that broke the Zombiefied-Camel’s back. I was in a discussion with someone recently on the subject of remake/reboots, and I said something along these lines to describe why, for me, they don’t work.So, you are having an event of some kind be it birthday, Christmas, satanic ritual, whatever. All your best friends or family etc are there. You have the best time, it’s a wonderful event. Laughter, tears, prophetic robes, etc. The whole thing couldn’t be more perfect. Now, lets just say, you enjoyed that event so much you tried to do it again years down the line and completely replicate everything that happened. It wouldn't work. No matter how hard you tried to make it the perfect re-event, it wouldn't happen. Because that first time was it. Okay, yes, it might be good, it might be verging on brilliance, or it could be awful.This is exactly the same for remakes/reboots.When the original Poltergeist was made, everything worked. Just like most films that will stand the test of time. Adding to them or taking away anything wont rejuvenate that magic, it will be another film on a list that’s marked “Totally Unnecessary Remakes.” There are so many great Horror films out there waiting to have their moment on the silver screen. Indie horror films that shine bright and wide, and have a damn sight more passion and creation to them than an endless, tired, conveyor belt of remakes. Will I see the remake of the new Poltergeist? specializing in Cornish Folklore and Mythology.